Darren G. Mire, the director of valuation for the Orleans Parish Assessor’s Office, has been appointed Commissioner to the Board of the Ernest N. Morial New Orleans Exhibition Hall Authority (Authority) by Governor John Bel Edwards. The Authority’s 12-member Board of Commissioners governs the New Orleans Ernest N. Morial Convention Center and is a political subdivision of the State of Louisiana. Mire is succeeding Commissioner Jay H. Banks, who has resigned and will begin his tenure as New Orleans City Councilman after being elected to the position in 2017. Mire served two terms as the elected Assessor of the First Municipal District of Orleans Parish from 2002 to 2010. 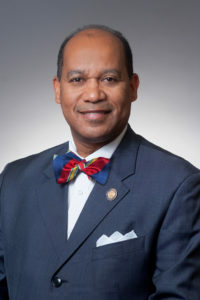 He is a member of the Louisiana Board of Regents, and a former member of the Southern University Board of Supervisors. He also serves as president of the Black Organization for Leadership Development, or BOLD. A life-long resident of New Orleans, Mire earned his B.A. in Political Economy and a Masters in Professional Studies in Political Management from Tulane University.